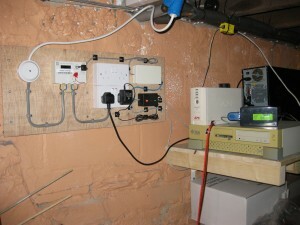 Overview of the server room with metering and FrankenUPS. I just wrote up a page about my latest project that I’ve just about finished up now: monitoring the electricity usage in our house, and modding my UPS so it runs for longer than it’s designed to. Since energy prices are constantly on the rise it would be wise to use as little of it as possible, but of course being a computer geek I run a server 24/7 in the house which makes up a large portion of our electricity use. I decided to monitor our electricity use at the server side and at the main fuse board so that, after figuring out what causes what spike and for how long, we can cut down our spending. The other part of the project was to hack my UPS a bit to extend its battery run-time from 18 minutes to around an hour by adding some more batteries. The electricity board like to cut the power off for extended periods of time so the longer the server can run on batteries the better. I got an iPhone! Rather exciting news I think you’ll agree. So far I love it! And O2 have even been OK, they originally put me on Â£35 a month contract (despite me telling the lady at least once I wanted the Â£30 a month one) but when I rang them up they said sorry, changed it and then gave me Â£10 credit. A nice change from them, then! Hope it will last! We have had a rather pleasant weekend, including trips to Arlington Court and Rockham beach and now there are only a few weeks until we go to North Yorks/Matlock Bath for a little holiday. And I am looking forward to the new laptops from Apple, because then I can get my other present! After struggling with trying to get the iPlayer Download Manager working on Jess’s PC for hours last night I gave up and used BitTorrent. Strangely enough I found and started downloading the programme I wanted in less than 5 minutes, and it was higher quality. Would this make you want to use iPlayer? I just installed the iPlayer Download Manager (DM as I’ll refer to it) last night on my wife’s Windows XP SP3 computer so that she could watch the episode of “Mutual Friends” that our Sky box managed to mangle. I decided to try the download manager due to the higher quality audio/video that you get compared to streaming. This proved to be an extremely frustrating experience. Once installed, I tried to download the programme, but the DM stated that there was a “DRM error” and that the web site would help me fix it. Unfortunately it told me no more about the error, and searching for “DRM error” in the FAQs yielded a variety of instructions to try to remedy the situation: resetting the Windows DRM folder, doing a “security upgrade”, re-installing Windows Media Player, re-installing the DM, none of it worked. I’ve been using computers since I was 12, have a BSc in Computing Science, and have been a Systems Engineer for over 2 years now, and try as I might I cannot get the DM to even start downloading this programme. It really saddens me that you found it necessary to over-complicate such a simple tool as a download system for TV with DRM and other measures that just make things very difficult to use. Around 2 hours after starting to wrestle with the Download Manager I gave up and turned to Google, found an “illegal” BitTorrent download and had that going within 5 minutes. This was far easier to download, will have no silly time restrictions on it and is higher quality than is available through iPlayer. I can also do this in good conscience considering I pay my ever-increasing TV license fee _and_ a Sky TV subscription. I hope you understand that by using technological countermeasures such as DRM actually made me try to find an alternative source for what I wanted to find, simply because it DID NOT WORK. I hope you can convey this message to your trustees and suppliers of programming to help them reconsider their opinions and impositions. Nothing much to report on from here. A dead hard drive, a bit of overtime, swimming, and now Autumn is almost here. The geese were flying over the Taw estuary this morning when Jess drove me in to work, so it must be near at hand. As is my birthday, when I’ll turn the ripe old age of twenty-four! We got back from Brittany late on Friday night, having had a wonderful holiday. We stayed in Gouarec and Yvais. The first house was owned by some English people and was full of all the home comforts, Sky TV, table football and a well equipped kitchen. The second was decorated with a ‘sea’ theme but despite looking a little odd we came to love it and it was only a few minutes drive from the sea. We went kayaking down the Nantes-Brest canal, where you went shooting down little slides, whilst at Gouarec. We moved to Yvais on the Saturday and went to the nearby town on Paimpol quite a bit, including seeing its amazing fish market on Tuesday, to Plage Bonapart (Jess drove in France! Well done her!) and another beach, to the coast and to look out of the Ile du Briten. It was brilliant! And now we are back to real life… Oh well! Not sure what to make of the finale of this latest series of Doctor Who. They just seem to roll out the Darleks and the Cybermen far too often, whilst the really frightening episodes – all by Stephen Moffet – feature instead mundane, everyday things like statues or the dark. At least Catherine Tate is gone, as Jess says! It was really annoying to tune in to see what happened with the cliff-hanger and get naff all, though. Well, no more Who for another two years, other than the usual below par specials, that is. I didn’t get half the stuff I wanted to done over the weekend. I had to work late on Friday afternoon (just until 16:00, but it still felt really weird!) and then Jess worked on Saturday morning, so I had a long bath and tidied a bit in our spare room, which is currently a computer-part graveyard. It rained all the rest of the day, so we Diablo-ed for a some of it. Yesterday we relaxed, walked Ferris and saw an odd film called Paris Je’Taime which featured a number of big stars/directors doing short films about our favourite city. I have next Friday off, which is nice, but for now it is working boy again. I spent most of my weekend playing The Legend of Zelda: Twilight Princess on our Wii. It is an excellent game and I am loving it! Takes me back to my SNES days of old. We also went to the North Devon Beer Festival 2008 in Barnstaple with Simon and Sarah. We had a great evening – including a curry at The Moghul – and tried lots of rather good ales! Jess and I are considering joining CAMRA at some point now, too. Just to prove that this isn’t (quite) dead yet, a happy birthday message to my very good friend Aram! I am so busy at work and busy at home with Ferris that I don’t seem to get round to posting much now. Jess covers most things in our life together, so I suppose you’ll have to content yourselves with reading her blog most of the time! I am going about setting up a metering system for our electricity here at home and trying to fit in a few games of Diablo II with my wife, too. Hectic doesn’t really cover it. In May we celebrated our first wedding anniversary and our fifth of being together by going to Paris. It was great and we had a couple of delicious meals! We have our holiday in Brittany to look forward to over the summer. I have never been to this region of France and we’re going with a big gaggle of family so it should be really good fun we hope. Then in October we have a break in our beloved North Yorkshire, as well. The best addition to our lives recently has been getting our JRT Ferris. He’s a lovely boy! Although Jess had a Labrador, Beano, when she was growing up, it is a first for me and I am really loving being a dog owner — even more than I expected to! He has just been in for his chip ‘n’ snip operation, but seems to be recovering excellently. I am off to see Jess’s Nan and help Paul herd the sheep in for sheering so I’ll stop now, but hopefully be back a bit quicker with my next post. But don’t bank on it! For quite a while now I’ve been reading xkcd, “A webcomic of romance, sarcasm, math, and language.” Here’s the latest strip: Commitment. Well it certainly has been a long time since I last posted, surprise surprise! Well, since that time Jess and I have got married, went on our honeymoon, bought a Wii, were visited by Aram, and finally, I got glasses! The wedding went off really well and a good time was had by all. In fact it was one of the fun parties that I’ve been to for a long time and everyone seemed to enjoy themselves on the whole. The registry office part was a bit strange, especially as we were promised the ability to change our vows only to have that idea ridiculed when we got there, and add to the mix some really stupid and unexpected poetry (even Jess will agree)…suffice it to say it’s not what we expected. But at least the party afterwards more than made up for it. We went honeymooning off to Paris, which was really nice indeed. We took the Eurostar again, and as usual had a smooth and comfortable ride, once again being amazed at the smoothness of hurtling through the countryside at 300 Km/h. When will the Brits admit defeat and make our railways run on electric? Anyway, we had a really nice time, stayed in a tiny little cramped hotel (that Jess has already described) that was simply fantastic, saw all the sights and generally had a fantastic time. In other news, we have also bought a Wii! Once Alex got his we managed to wrangle a week with it while he was on holiday in Paris and got hooked. It’s been a great source of fun, especially Wii Tennis in which I am proudly a Pro. Much more fun than the real thing. Jess also got Harry Potter for it, which seems fun but I haven’t tried it yet. It’s one of those where you have to wave the Wiimote to cast spells and such, so fun but quite hard too. We were also paid a visit by the Flying Finn not too long ago. It was really nice to see him, and we have a great time going round a few sights and having a relaxing time. We shall have to reciprocate, though I dread going through customs in the US! We went to Baggy Point near Croyde, which was especially nice and the views were amazing! Finally, my parents’ extreme short-sightedness is catching up with me, and I now wear glasses. It’s not a huge prescription, don’t need them for driving (but will use them to drive) or anything, but can tell I’ll be wearing them most of the time anyway. It really made a world of difference, and can now see leaves on trees in the distance instead of just green blotches, which I had just got used to seeing. And to top it all off, we’ve just booked a holiday to go and visit Dublin in November. I’m really looking forward to it, since I’ve never been and I’d like to see where Jess lived for so long. We won’t actually be going right out to Co. Clare, but it’ll be nice to see a small part of the place nonetheless. Hopefully we can line up a tour of the Guinness brewery!